My son is currently nearing 18 months, so this is a bit of a “flashback post”. I wanted to talk about Sagan’s 1st Birthday Party. 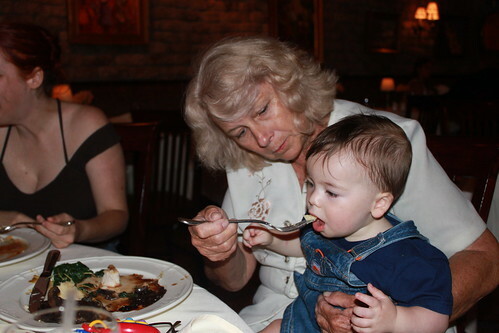 We had a small family dinner at Occoquan’s Bistro L’Hermitage. In my family we call it “The Fancy French Restaurant”. I’m certain there are other families who refer to the restaurant in the exact same manner. It *IS* a fancy French restaurant with expensive décor and exotic, well-cooked entrees. The menu sports appetizers such as “Seared Duck Foie Gras”, “Fricassée d’Escargots”, and “Friture D’Huîtres”. I believe in order that’s duck livers, snails and oysters. This place just screams 1 Year Old, right? Well a little bit of a back story. 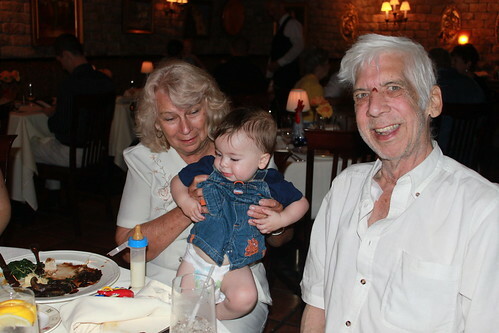 My father and Sagan share a birthday and “The Fancy French Restaurant” was my father’s favorite restaurant for special events. I decided on the actual birthday, we would go take Dad out to a special dinner. We could hike with Sagan the following Saturday. There are a lot of things I know now, but didn’t know at the time. The first is this– I had no idea that my Dad only have 15 more days with us. No idea. There were many times in the previous months where I thought, “This is it. My Dad is dying.” But not then. Everything seemed stabilized, everything seemed to be looking up. What I did know was my Dad had an extremely rough year– full of pain and nausea and more pain. I knew my father deserved a great night. The evening was shaky from the get-go. My father had dialysis that morning, so I knew he was feeling fatigued. But I didn’t know the extent of the pain he was in that day. He had lost a substantial amount of weight in the previous months, so to add to the pain, he found the air conditioning uncomfortably cold as well. My brother was 20 minutes late. So we all waited, admiring the fresh white linens and the candlelight. This meant we had this poor man — tired, cold, and in pain — waiting. 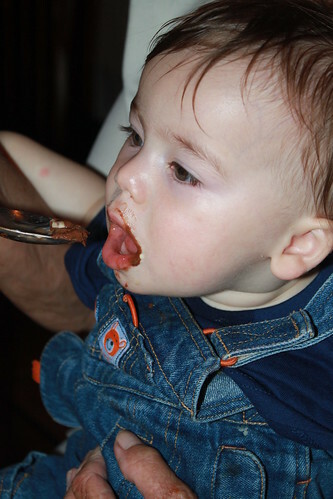 Then my 1 year old son gagged on a piece of hard crust and vomited…inside “The Fancy French Restaurant”. And shortly afterwards my father, remember in great pain, started snapping at people in his typical loud voice that tends to carry and echo in small restaurants with decorative stone walls. He was even short with people he normally would not have been– like the innocent wait staff. My brother showed up, we ate. Although my father did get to devour the duck liver he had been coveting, as soon as he was done he retreated to the car to sleep and get warm. The restaurant brought out two free desserts for the two birthday boys. Only by that time, my poor Dad was long gone. Where my father was concerned, the evening was far from the home run I was hoping for. And then there was Sagan. This supper that wasn’t intended for him turned out to be a blast for the little guy (besides the whole gagging on bread thing)! He adventurously enjoyed sampling all the various entrees which were mostly seafood. 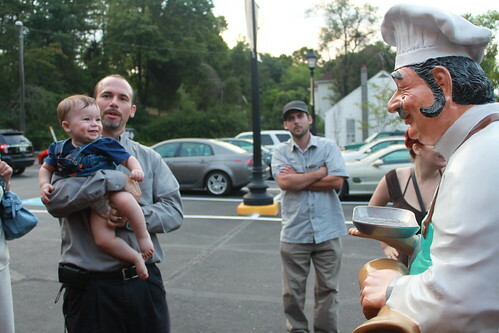 He had a fabulous time giggling at the funny chef statue outside. And then he got not one but two free birthday desserts to sample. He loved, loved, loved both the free crème brulee and the free chocolate mousse. Oh, did I mention he loved the chocolate mousse? So on the Sagan-side of the things, the evening was a resounding success! Still, after my little birthday boy fell asleep, I was sad about the older one. I went outside on the balcony, breathed in the summer night air, and failed miserably to purge that huge lump I had in my throat. I was so disappointed. I had so very much wanted to give my father a special evening. There is one final thing I didn’t know about that night. That night, my father didn’t tell my uncle about the pain or discomfort. It wasn’t notable. Instead, he talked about his happiness and his gratitude. How he got to be with his wife and all three of his children and how he was able to share in his grandson’s very first birthday. As I fought off tears upstairs on the balcony, I was oblivious. My father, surrounded by family, had a most special evening after all. Grandma and the Two Birthday Boys! few signs, but even with a limited vocabulary, we found it to be a helpful experience. Sagan uses the sign “More” mostly as “Want”. It doesn’t necessarily mean he covets more of something… it means he wants something…and it can be something entirely new. Luckily, since he mastered pointing as well, he usually signed “More” and then pointed to what he wanted. Now he says “Mo” verbally as well. Nonetheless, we still have moments where it takes a little deduction to figure out exactly what he wants. Sagan:(increasingly frustrated) MO! MO! MO! Our biggest success story with the word “More” came in early November. Little Sagan contracted a stomach flu and spend an evening vomiting (mostly on or over Mommy’s shoulder). The next day, he had a lot of clear liquids and as the day progressed we decided to introduce solids back. We decided to go with some noodles from chicken noodle soup. We gave him a few spoonfuls and all of a sudden Sagan started coughing. Ryan and I froze. Was this just a “cough” cough? Was this a “something went down the wrong pipe” cough? OR…. was this the dreaded “WATCH OUT– HE’S GONNA BLOW!” cough? Well as soon as Sagan finished coughing, he couldn’t understand why we were just standing there. And just like that, his cough was no longer ambiguous. We knew our little guy was on the mend. Just from a single sign. “Help” is really new to Sagan’s vocabulary. He literally picked it up a week ago, but I have seen enough of a positive effect to warrant documenting. When I was first dating my husband, my mother-in-law had some preciously embarrassing stories about how baby Ryan would try to do something beyond his means (like picking up his daddy’s heavy barbells). My mother-in-law reported that little Ryan would scream and scream and scream at the exertion and frustration of the task, but wouldn’t give up. I don’t have the data to determine if that reaction is common among all babies, but I do know little Sagan deals with challenging tasks in a similar manner. Toy out of reach? Grunt / Scream / Cry. This shape doesn’t fit into the hole you think it should? Grunt / Scream / Cry. The truck you are trying to roll is stuck on the area rug? Grunt / Scream / Cry. Then last week he learned “Help”. Adding one little word to his vocabulary has given Sagan a whole other option to dealing with tough tasks. Instead of getting frustrated to point of screaming and crying, he simply looks over at the nearest adult. It’s sweet. But don’t worry– Ryan and I don’t get off that easily! Little Sagan still has plenty of “legitimate” causes to get upset. P.S. If you are interesting in accounts from other parents, Ryan and I found the post “Baby Sign Language as a Window into Comprehension (or lack thereof)” from Kitty’s Heart of Nature to be particularly inspirational. P.S.S. If you have a sign or word that was particularly helpful with your children, definitely share! We’re still new parents and are always eager to increase our own knowledge!